The Global Mining Standards and Guidelines Group (GMSG) has embraced the Exploration and Mining Business Reference Model (EM Model), which was approved by The Open Group in 2013. This is the first approved standard for the natural resources industry developed by the Exploration, Mining, Metals and Minerals (EMMM) Forum, a Forum of The Open Group, a vendor- and technology-neutral consortium. The development of this model was managed by The Open Group South Africa, represented by Real IRM Solutions. “The EM Model defines the standard set of business activities in an exploration and mining business, organised in a structured way against a core value chain or value stream,” says Sarina Viljoen, forum director of The Open Group EMMM Forum and senior consultant at Real IRM. Across the industry, margins are tight and pressure is mounting to tweak and reconfigure business processes to meet the current challenges. In this context, the model is important for a number of reasons, according to Viljoen. “It is the first approved standard for the mining and resources industry. 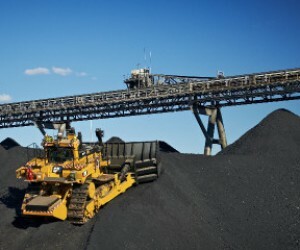 Secondly, it emerges at a time as the gap widens between output expectations and funding to make things happen, and while mining companies are seeking comprehensive solutions to make their operations productive and viable. The new standard offers a unique opportunity to collaborate around a single model that is generic and widely applicable, yet also offers opportunity to explore specific activities on a more granular level. “The Exploration and Mining Reference Framework truly defines a ‘mine in a box’, and can be used to guide vendors in the services and applications the organisation requires. The EM Model tells us which process must be supported; the business capability map describes the capabilities that we require; and the information map details the information that should exist at various points in time,” says Viljoen. The model was developed in line with the rigorous enterprise architecture approach, which saw the workgroup considering different aspects of the industry, focusing on business processes, business capability and information components in the natural resources industry. Being part of the bigger framework implies that the model and maps all support each other in addressing different aspects of the business. The overarching goals of the framework, intended for industry-wide use, support positive movement forward for the industry as a whole, and act as a catalyst for change, knocking down proprietary walls in a bid for solutions to common problems. Tim Skinner, president of SMART Systems Group and chairman of the Global Mining Standards and Guidelines Group, says that the model works as a “functional decomposition” of business activities, and that there is benefit for strategy and project planning. Skinner himself has worked extensively with the development of similar models, with a focus on systems work and automation strategy.